The Titan Fitness Extreme over the door pull-up bar is perfect for doing strength body weight exercises, both on the door and on the floor! With more bars and grips comes greater exercise variety than our standard pull-up bar! For vertical exercises, you can workout your shoulders, biceps, back and tricep muscles with chin-ups, pull-ups, leg-lifts and reverse crunches. When you place it on the floor, you can work out your abs with crunches, your triceps with dips, and your chest with push-ups. 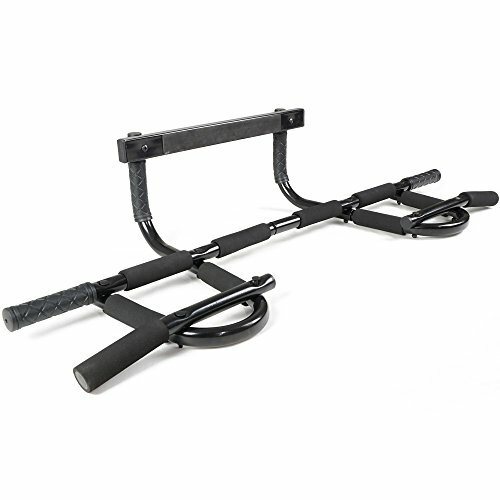 The Extreme Titan Fitness pull up bar is easy to assemble, does not require mounting, and is very versatile and affordable! - Width: 16.1" - Depth: 9"